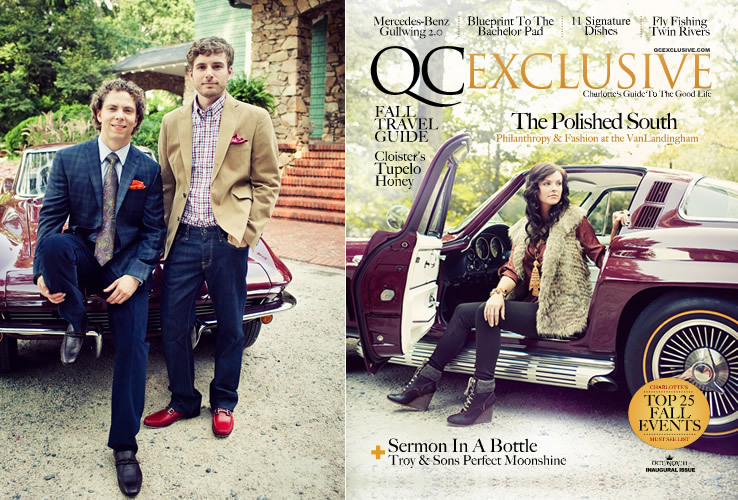 From our start in 2011 to the present our team at QC Exclusive Magazine constantly strives to deliver Charlotte’s best content, from creative writing to stunning photography. We truly hope you have enjoyed each and every one of our issues and the progression of our brand. Below you can read our very first publishers’ note, circa October 2011, when we (all-in and anxious whippersnappers) took that first leap, as well as the publishers’ note in what probably is our most important issue since that inaugural QC; the issue where we relaunched QC Exclusive. The refined look features a new logo lockup, fonts, page layouts, and so much more to accompany the same great content. Thanks for reading our story and we hope you join us on this magical ride for many more years to come! Over two years ago, life looked very different to publishers Jon-Paul “JP” Grice and Brett Barter. JP was living in Boone, NC working for a struggling custom home magazine and I was a freshly transplanted Charlottean (by way of Michigan) working as a commercial leasing agent. We were first introduced to one another in 2009 by a mutual friend, Ryan Strawn. I was living with Ryan at the time, and JP was his old college buddy who would come crash on the couch every now and then. Upon first meeting, we didn’t exactly hit it off. JP was a stereotypical, slow talkin’ southern boy, and I was a stereotypical, high strung, loud talkin’ Yankee. At least that’s what each of us thought about the other at the time. But that changed, and changed abruptly. On August 22, 2009, I awoke around 5am to what sounded like a stampede of horses going through my house. Upon further investigation, I soon realized it was just my roommate Ryan getting ready to head off on vacation to Hawaii with JP and several other friends. They had been planning the trip for months and I remember seeing how excited he was to embark on his journey. I bid him farewell and safe travels. That was the last time I saw him. Two days into their trip, Ryan passed away in a tragic accident. That day changed my life, JP’s life, and many others’ lives forever. Merely acquaintances before, I became, in an instant, close friends with many of Ryan’s family and friends, including JP. During that time of coping, both of our careers took a turn for the worse. When the real estate industry tanked, I was out of a job. JP experienced a similar feeling of hopelessness when his employer couldn’t make payroll. Both bending but not broken, we discussed our current situation and decided that life was too short to sit idle. This was the time to take control of our lives and do something that would truly make us happy. This is how QC Exclusive was born. This is our reinvention. Long nights were spent creating our website, www.qcexclusive.com. Tanks and tanks of gas burned while we drove around searching for business owners that believed in what we were doing. Months passed as we conceived, strategized, and planned, Finally, today, we are executing our inaugural issue of Charlotte’s truest lifestyle publication. From start to finish, 15 hard months have passed. In the pages of this first issue you will find stories of reinvention and innovation, written and photographed with style and soul, by contributors who started off as complete strangers to us but now are close friends. Read it cover to cover so you don’t miss the compelling interview with William Wilson, eleven signature dishes sure to make your mouth water, an introduction to the world of moonshine, or any of the other stories in between. We sincerely hope you enjoy it. We want to thank everyone who made this possible. And to our inspiration, Ryan, we dedicate this to you. JP told me that you were always saying, “Quit complaining and just start your own damn magazine.” Well, dammit, it took a while, but here it is. Does time speed up as we age? 2015 was an absolute whirlwind of a year for us. It was filled with a lot of challenge, change, and a hell-of-a-lot of growing up, both personally and professionally. As a company, we finally outgrew the cost-conscious and stress-free home office and transitioned into a bonafide office space complete with all the bells and whistles—monthly rent, utilities, etc. Change is never easy and can be downright uncomfortable at times, but it’s inevitable and it’s necessary for growth. Sure, the days of rolling out of bed, going into the “office” and answering emails or phone calls in our pajamas are long gone, but on the flip side, our team now has an amazing space that we’re proud to show off, a place that is truly representative of the QC brand and what it stands for. In August, Brett and his wife Layne welcomed a beautiful baby girl named Lennox into the world—an amazing whirlwind unto itself. Then, there were months of lessons to be learned, sleepless nights, and a fever scare that landed the little cutie-pie back in the hospital. It all ended up just being precautionary and now Lennox is happy, healthy, and growing like a weed…a very chubby weed at that. Looking back, building QC Exclusive has been a lot like raising a child. Lots of time and energy is spent on both. Countless sleepless nights are endured and visceral events experienced in a short amount of time. And with each stage comes change, evolution, maturity, and a whole lot of joy. Just like a child, our QC baby is growing up! When you picked up this issue you may have noticed we’ve donned a new logo and cleaned up the layout for both the cover and content. As you flip through the pages you’ll see some other subtle design changes, new department names, and even more great photography and writing. A lot of these changes took months of thought and deliberation, and were made to enhance our number one priority: celebrating, in print and online, the best that our city has to offer, striving to be the quintessential Charlotte magazine. We hope you like what you see and we would love to hear what you think. 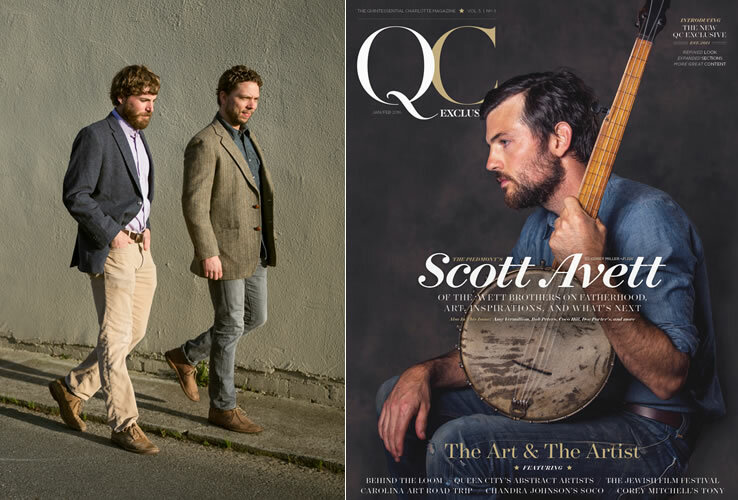 In this issue read about the Piedmont’s own Scott Avett of The Avett Brothers and his evolution from touring musician to fatherhood, meet Chandra Johnson and learn about her new and emerging SOCO art gallery, explore the town of Seagrove’s rich art heritage, and read the inspiring story of the Tony Award-winning Charlotte educator, Corey Mitchell. Enjoy, and from the new QC, we wish you nothing but the best in 2016.